It's the holiday season and the time of year when there are plenty of libations at nearly every event and or celebration. However, you may not be aware of all the ingredients in your favorite libation, especially if that drink is apple cider. New research indicates that, in addition to alcohol, some hard ciders may contain a hefty dose of added sugar, which may not be disclosed on the label. The researchers, including Sheryl Singerling, Laura Burkemper and Zach Sharp in the Department of Earth and Planetary Sciences and Center for Stable Isotopes at The University of New Mexico, reported their results recently in a paper titled Measurement of Adjuncts in Hard Ciders Obtainable in the United States Using Carbon Isotopes in the American Chemical Society's Journal of Agricultural and Food Chemistry. In 2015, the World Health Organization's made a recommendation to limit added sugars to 25 grams per day. Singerling and colleagues wanted to find out if several popular brands of hard ciders contained added sugar that wasn't disclosed in the ingredients list. The purpose of this work was to evaluate whether hard ciders obtainable in the United States contain added sugars, either in the form of cane sugars or corn syrups. Hard cider is made by fermenting apples or apple juice concentrate and is growing in popularity in the United States. Apples contain plenty of natural sugars, so adding sweeteners to cider is unnecessary for the most part. However, cider makers could add sugar to further sweeten the beverage or speed fermentation. Singerling, who was at UNM at the time of the study, and her fellow researchers used a mass spectrometry at UNM's Center for Stable Isotopes to analyze the carbon isotope compositions to detect possible adjuncts of 23 ciders sold in the U.S., specifically corn or cane sugar, which are C4 sugars. In contrast, the main ingredient of hard ciders is fruit, mostly apple, juice which is derived from C3 plants. Apples, pears and berries are all C3 plants for example. Six of the ciders were imported from Europe, while the rest were made domestically. They found that 60 percent of domestic ciders contained added sugars from cane or corn syrup, compared with 20 percent of imported ciders. They found the labeled ingredients of ciders were inconsistent with the carbon isotope ratios. However, beet sugar is the most common sweetener in Europe, and the method utilized bvy the researchers couldn't distinguish between apple and beet sugars or honey. 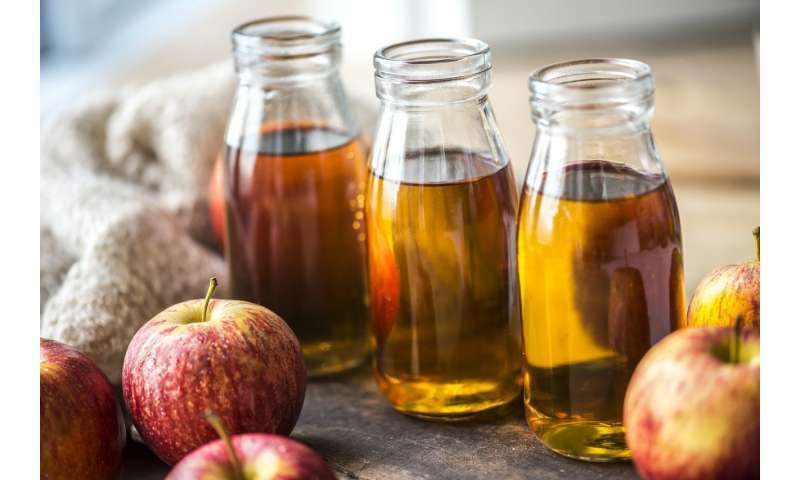 Because of widespread discrepancies between isotope ratios expected from ingredients lists and the observed values, the researchers concluded that labels are not a reliable way to determine whether a cider has added sugar. Although manufacturers are required to list the amount of sugars per serving on the nutrition facts panel, they don't have to list those that naturally occur in the product to those that are added during production. Consuming excessive amounts of added sugars can of course increase the risk of developing health conditions such as diabetes and high blood pressure. Clearly, that ingredient labels for hard ciders obtainable in the U.S. are not a reliable means of determining authenticity. "If the industry continues to grow and consumers become more health-conscience concerning their added-sugar intake, the labeling system currently in place for alcoholic beverages may need to be reevaluated," the researchers concluded.